For High School Debating Teams - A challenge to see how good you really are ? The United Nations Association created MUNA to enable young people to simulate the workings of the United Nations Assembly by having teams of about three Year 11 students represent a particular U.N. country in debates on matters of world political and social concern. Students are given the opportunity to improve their research, debating and public speaking skills by addressing a wide range of contemporary world focussed issues. The U.N. Assembly chamber is recreated replete with country name plates, national flags and where the students are encouraged to wear the national costume of the country that they represent. The Assembly is chaired by the “Secretary General”, and judged by Rotarians. Prizes are awarded in various categories such as best overall representation and the best national costume. The first and second placed teams go on to represent the District at “National MUNA” in the Old Parliament House, in Canberra, in August. 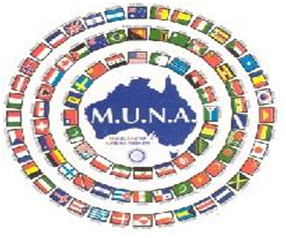 MUNA is about building bridges of goodwill for world peace and understanding through a personal involvement in the acceptance of situations that reflect the opinion of "adopted" countries. It is one of Rotary's core objectives. The United Nations Association created MUNA to enable young people to simulate the great debates of the United Nations Assembly. Rotary first conducted MUNA at Winnipeg in Canada. It was introduced into Australia by Lake Cargelligo Rotary Club (District 9700) in 1980; the Rotary Club of Forbes realized the potential for Rotary to promote MUNA and today 19 out of 23 Rotary Districts in Australia participate. In 1977 the Rotary Club of Canberra Sunrise hosted the first national MUNA which took place in the Senate Chambers of Old Parliament House. Rotary with its spread of membership across 168 countries is well placed to advance the goals which it shares with the U.N.
Local High schools should contact our Youth Services Chairman at petersheehy10@gmail.com to arrange for the processing of application forms and sponsorship. Over recent years Engadine High School has sent teams to MUNA, the most successful being in 2014 when their Team reached the National competition in Canberra where they unfortunately meet some very tough opposition. Their school magazine, " Flannel Flower " reported at the time the following item " Engadine High's credentials for social justice were officially represented by future diplomats, Hayden Sloggett, Josh Warren and Callum Tsambalas, who recently won the 'Model United Nations General Assembly' for the Eastern District. This Rotary sponsored event requires students to represent a nation and debate resolutions against teams from other schools. Our team represented the United Kingdom and have spent many weeks researching U.K foreign policy, including the potential for change as a result of the uncertainty surrounding the recent U.K election. The team were required to write and deliver five speeches in response to Resolutions, and engage in impromptu debates with other delegates. Persistence and diligence through lunchtimes at school and after have been well rewarded as the team will now attend the National competition "
Well done Lads - A great experience.